This was the best salad I have eaten in a long time! I wasn’t keen to begin with. In fact, if I wasn’t part of the French Fridays with Dorie group, I would not have even paused at this page. But I am sooo glad I did! I had no idea that placing a sliced onion into a bowl of cold water and refrigerating it, would make it so crispy and crunchy! The vinaigrette of Dijon mustard, honey, sherry vinegar, olive oil, salt and pepper elevated the taste of the entire dish. The assembly was the simplest and best part though! I just had to scatter the leaves of rocket (and I had spinach as well). Sprinkle the cherry tomatoes. Layer the cooked beets that were chilling in the refrigerator with the vinaigrette. Crumb over some goat’s cheese and top with the icy red onions. The combination was honestly unbeatable! Can’t wait to see what everyone else at French Fridays with Dorie thought of this week’s recipe and what they served it with! Tags: cooking, food, french food, french fridays with dorie, recipes, salads | Permalink. 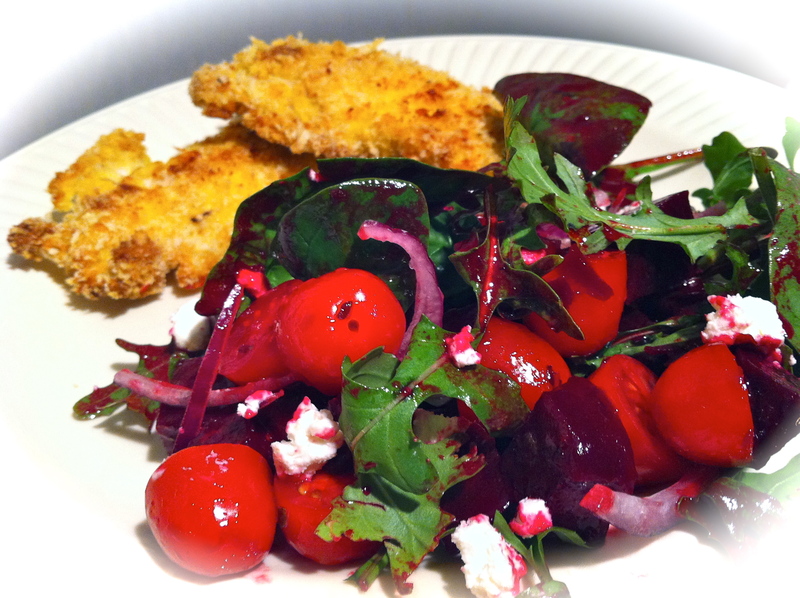 Your salad looks so colorful and bright, but I’m eyeing those panko-crusted chicken tenders! The purple in your onion really stands out in your photo. Beautiful! I wasn’t overjoyed at the thought of this recipe, either, but I, too, was pleasantly surprised. I’d even make it again, especially if I could get my hands on some nice, fresh-grown beets. Glad you liked it! What a pretty salad. It would brighten any table. This is probably one of the best looking salads I’ve seen today! I love how the edges of the goat cheese turned pink from the beet juice. Great job Sanya! Beautiful salad! Happy to hear that I’m not the only one who likes beets. Beautiful! Nice additions and such a colorful photo. I’m getting good ideas for when I can actually find fresh beets. I don’t think I got excited enough to do a really great job with this recipe. You are, however, inspiring me. I’m roasting more beets as I type! 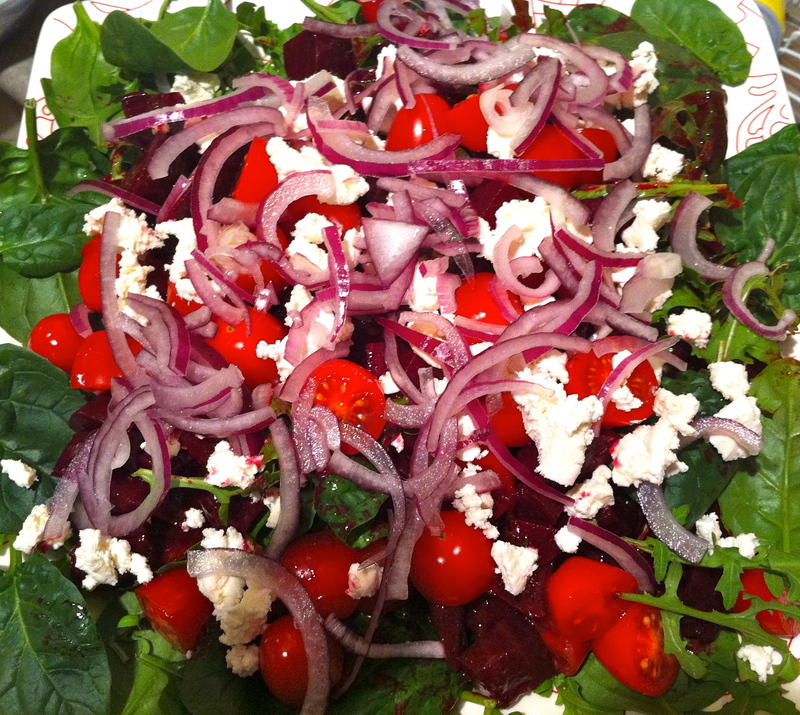 LOVE your salad…so perfect! Your salad looks fantastic and I’m now wanting some chicken tenders to go with my leftovers! Glad you enjoyed! So many colors – I am sure the chicken was happy to be paired up with it! I missed this one, but your post makes me wish I hadn’t!